SHOCK and sadness has been expressed after the sudden death of a well-known councillor. Councillor Frida Edwards died at Queen Alexandra Hospital after being in an induced coma following a serious illness. She was 55. Cllr Edwards was the first black councillor to serve on Havant Borough Council after being elected to represent Bondfields ward, which covers West Leigh. She was the owner of the Hayling Ferry for many years until the company went bust earlier this year. It is understood she was diagnosed with a serious condition before going on holiday to the Seychelles several weeks ago. But when she returned the illness had accelerated and her condition rapidly deteriorated until she was put into an induced coma three weeks ago. She died on Sunday, surrounded by her family. Fellow Conservative Leigh Park councillor Mike Fairhurst said: ‘It’s very, very sad. Frida, mum to daughters Marie and Tina, took over the ferry after her husband died and she fought to the bitter end to save the service. She was first elected to the council in 2010 and was re-elected last year. Frida, of Oaklands Road, Havant, was a trustee at Leigh Park Community Centre. Cllr Terry Hart, a Labour councillor for Bondfields, said he received a message from Frida at the end of November asking whether he could take on her casework for the ward. ‘She was always full of energy,’ he said. 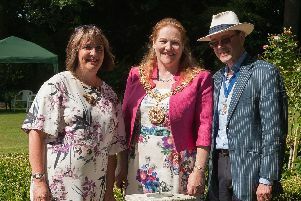 Hayling Island councillor Andy Lenaghan added: ‘Frida was a hard-working councillor.